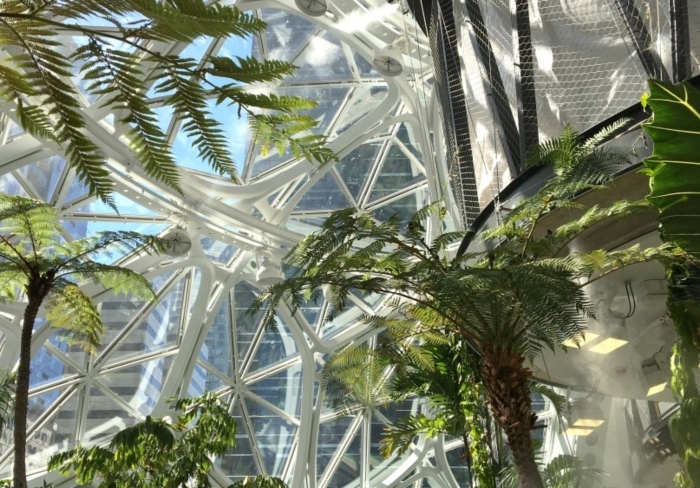 The Spheres are a place where employees can think and work differently surrounded by plants. The Spheres are a result of innovative thinking about the character of a workplace and an extended conversation about what is typically missing from urban offices – a direct link to nature. 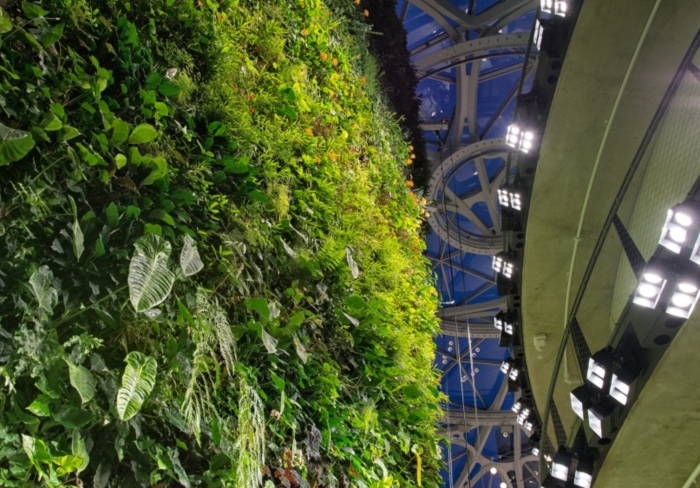 The Spheres are home to more than 40,000 plants from the cloud forest regions of over 30 countries. 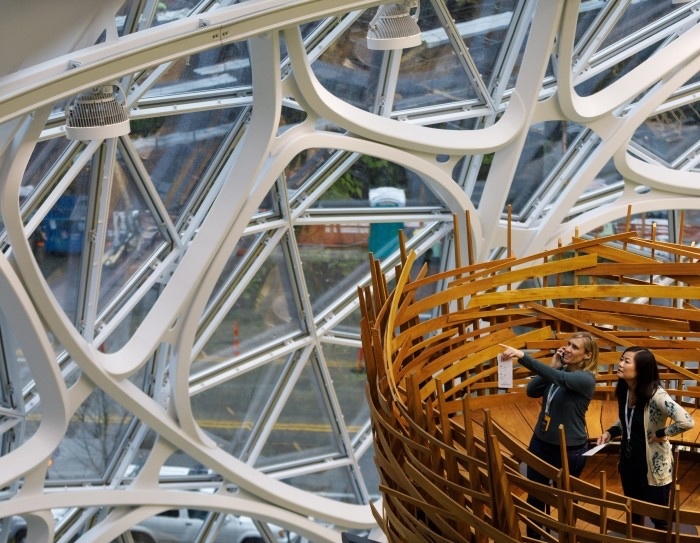 An indoor garden from the start, The Spheres were first envisioned as a curved glass building filled with plants and tall trees. During early planning, the design team studied the form and function of several sphere – like conservatories around the world, including the UK’s Kew Gardens, the Mitchell Park Conservatory in Milwaukee, WI, and La Biosfera in Genoa, Italy. Eventually, three distinct buildings emerged, and their shape and geometry evolved over the course of the design process. One driving philosophy behind the plant collection was the concept that The Spheres should feel like “year five on day one“. In light of this principle, the team sourced plants from botanical gardens, private growers, and universities all over the world years before The Spheres opened. These plants still grow in a greenhouse in Woodinville, WA to sustain The Spheres today. Plants regularly circulate between The Spheres and the greenhouses dependent on the season. The very first plant logged in The Spheres plant collection was a Mountain Cacao specimen. Also known as Herrania balaensis, this Ecuadorean cacao species produces pods that can be used to make a sweet and high quality chocolate. June 2015 marked the start of construction of The Spheres. The Spheres are really two different buildings – an outer frame with an interior concrete core. The core was made with 12 million pounds of concrete reinforced by 2.5 million pounds of rebar. At the base of The Spheres, a 400,000-pound ring beam transfers the heavy loads of gravity, wind, and seismic forces from the glass-and-steel façade to columns in the floors below. A geometric shape called the pentagonal hexecontahedron forms The Spheres‘ steel frame. The Spheres‘ shape is based on one of 26 known subsets of Catalan solids named for the Belgian mathematician who first described them in 1865. The building consists of elongated pentagonal modules that appear 180 times across the three spheres. By connecting each angle of the module to a centralized hub, the architects created a fluid yet modular pattern that could be repeated throughout the building. A steel fabricator in Oregon mass-produced the modules that were shipped onsite and assembled like a puzzle. The Spheres‘ façade contains 2,643 panes of glass. The last pane was put into place in December 2016. Our plants need more daylight than the Seattle weather usually provides so the type of glass selected for the façade was important. 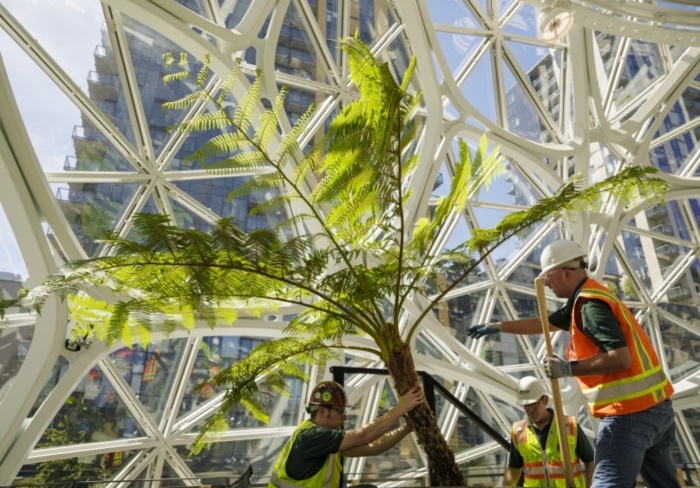 To test it out, the Amazon horticulture team built a small greenhouse in Woodinville, WA using the glass planned for The Spheres. This mockup greenhouse allowed the team to test light levels, temperature, and humidity in a realistic environment. With more than 25,000 plants woven into 4,000 square feet of wall, the Living Walls are an innovative demonstration of biodiversity. These walls are the brainchild of Horticulture Program Manager, Ben Eiben. Ben and his team assembled the living walls by growing the plants on mesh panels at the greenhouse. When the panels were ready, they were transported and attached to the growing surface. With careful preparation, the team assembled The Spheres‘ tallest wall in only two weeks.